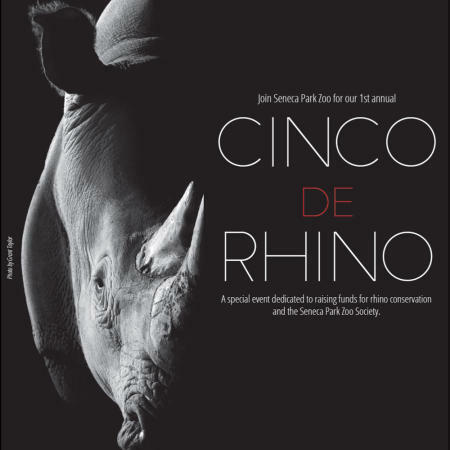 The Seneca Park Zoo Society is proud to announce a new fundraising event, Cinco de Rhino, to take place at the Zoo on May 5, 2016.This 21-and-older Happy Hour will leave behind the margaritas of Cinco de Mayo in favor of live music, beer and wine tastings, and prize drawings while highlighting the conservation efforts the Zoo and other groups are making to help all five species of rhinos thrive in the wild. Rhinos are at risk in their natural range due to habitat loss, poaching, and the illegal trade of their horns, which are mistakenly believed to hold medicinal properties. Populations of rhinos in Asia and Africa have fallen from 500,000 at the beginning of the 20th century to only 29,000 today. A portion of all proceeds from Cinco de Rhino will go to the International Rhino Foundation, a nonprofit working to protect this endangered species from extinction. Admission includes beer and wine samplings, as well as a dinner platter and beverage. Guests will enjoy music by Significant Other, Wii bowling, rhino conservation education, and a silent auction. Additional beer and wine, as well as special origami rhino masks and other merchandise in the ZooShop, will be available for purchase. Sponsored by Crosby Brownlie, Inc., the evening will also feature a drawing for the chance to participate in an exclusive behind-the-scenes meeting with Bill, the Zoo’s resident white rhino, and a zoo keeper. Drawing tickets are $10 each and must be paid in cash. The winner of the drawing, with up to five friends, will receive the opportunity to participate in a special “meet and greet” with Bill. Tickets are on sale now and cost $40 when purchased online in advance. Tickets purchased on the day of the event will cost $45. Guests must be 21-years old and able to provide proper identification to attend. The event will take place rain or shine. There are no refunds. 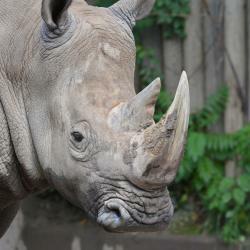 Internationally, and in our own backyard, Seneca Park Zoo plays a key role in species survival. Chartered as an educational institution in 1957 by New York State, the Seneca Park Zoo Society plays an integral role in supporting Monroe County, the owners and operators of the Zoo. Together, we are working to bring animals back from the brink of extinction.